Regular Nick: "Hey, The Dillinger Escape Plan made it into Guitar Hero! That's awesome. And, nice... you can play through Rush's 2112, and it's narrated by bassist and vocalist Geddy Lee himself. Man, this is going to rock." Warrior Nick: "Sweet holy hell, why did I just turn into a f**ing rock n' roll chupacabra?" 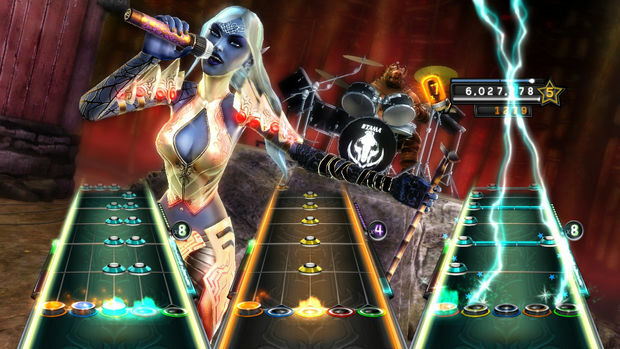 Guitar Hero: Warriors of Rock gets its name from the game’s all-new “Quest Mode,” a story-driven experience where players must use their skills to form an unstoppable team of monster musicians. The goal, to unleash the Demigod of Rock who will face off against The Beast, a malevolent rock-hating creature that… wait, what the hell am I talking about? I can’t be serious, right? Yes, this is a thing that happens, and it’s the basis for one of the most outlandish music game campaign experiences gamers have ever played. Narrated by Kiss-bassist Gene “I’m getting a check for this, right?” Simmons, you’ll play through a number venues unlocking “warrior” after “warrior” by completing some of the game’s 90-plus songs. Once fully you’ve rocked fully enough to the game’s liking, you’ll unlock an alter-ego, “rocked out” version of the game’s characters. Punk rocker Johnny Napalm turns into a teleporting elf demon, for example; snakes, boars, headless horsemen, and more are all accounted for. All of this would be hilarious if tongue-in-cheek comedy were the intended goal, but Warriors of Rock takes itself far too seriously at every turn, despite the absurdity. While the game’s story and look is often compared to Double Fine’s Brutal Legend (they’re obviously inspired by the same sources), there’s are too few winks and nudges in Warriors of Rock for one to laugh comfortably. If there’s a joke, the player is never really let in on the fun; the transformation scenes and in-game creatures simply stumble awkwardly, the viewer unsure if what they’re watching is comedy gold or an homage that completely misses its mark. While there are no celebrity rocker appearances here, watching Kurt Cobain belt out a Taylor Swift song managed to be less incongruous than a group of on-screen demons harmonizing to Queen’s “Bohemian Rhapsody.” The difference here is that Warrior Johnny’s psychopathic widow can’t log into her Twitter account to complain about it before calling her lawyers. Along with the rock warrior transformations comes power-ups, which can be used in a variety of ways to increase your score and overall star count, sometimes upwards of 40 stars (as opposed to the traditional five or six). These powers, once unlocked, range from increasing your multiplier to protecting your streak, and more. Powers can be combined to further boost your earnings, while also littering the game’s already busy heads up display with power up icons and lightning bolts shooting across the note highway. On one hand, there’s something rather rewarding about enabling these powers, and earning additional points and star totals, beyond anything you’ve seen before in a Guitar Hero game. But on the other -- while they can be helpful on some of the more challenging songs -- it doesn’t change your goal, which is to hit as many notes as possible. With that in mind, they’re an interesting addition, but they ultimately feel about as useful and rewarding as using a cheat code. As as the core gameplay is concerned, if you’ve played a previous Guitar Hero game, there’s no need for a re-introduction. The plastic instrument/note-matching is as fun as ever, despite the game’s rather bizarre visual wrapping paper and themes. 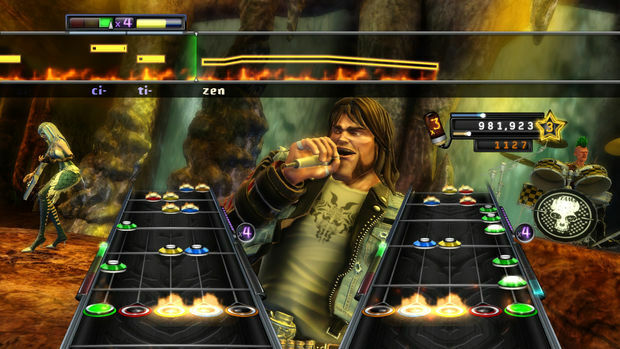 Everything from Neversoft’s previous Guitar Hero games makes a return -- drums, vocals, the ability to play with any combination of instruments, drop-in and drop-out, and so on. Also like the previous games, the timing of hitting the notes -- especially on guitar and bass -- is so open and forgiving, it’s borders ridiculous. Particularly when it comes to the game’s clear “tapping notes” (originally designed for the Guitar Hero 5 touch sensitive slider pad, which isn’t a feature on the latest iteration of the guitar), it almost seems too easy to nail even some of the game’s more complicated progressions. While it does a great job of making me feel good about myself, some of the challenge on the game’s more complicated runs is stripped away. That’s not to say that it’s too easy, because it’s obvious that Neversoft has gone out of its way to pack Warriors of Rock with some of the toughest songs the series has seen to date. With particular respect to the guitar (which the game’s setlist clearly favors), there are a number of songs designed to put blisters on your fingers. John 5’s “Black Widow of La Porte” comes to mind, along with one track, “Sudden Death,” written for Warriors of Rock by Megadeth’s Dave Mustaine. Even with the more open note timing, these tracks are clearly authored for expert players only, and they're going to eat up the challenge. With the game’s desire to give you a workout on the fretboard comes some odd charting decisions, however. In particular, the chugging, opening riff to Black Sabbath’s “Children of the Grave” -- played on a real guitar on an open “E” string -- is spread across two notes, the only reason for which is seemingly to make it more complicated. For anyone with a musical ear, stuff like this will be obvious to the point of being distracting. While I’m all for making the game as fun to play as possible, there are plenty of riffs spread across the disc that are inherently complicated (read: “fun” for many Guitar Hero players), it seems pointless to go out of the way to make the easier ones more difficult. Fans looking for a meaty experience are in for a treat with Warriors of Rock, as the game’s massive soundtrack is matched by the number of things it throws at you to do. While the “Quest” can be completed in a few hours (and doesn’t require you play all of the songs -- you can skip Nickelback! ), you can go back and “conquer” each of the tracks for a full completion. 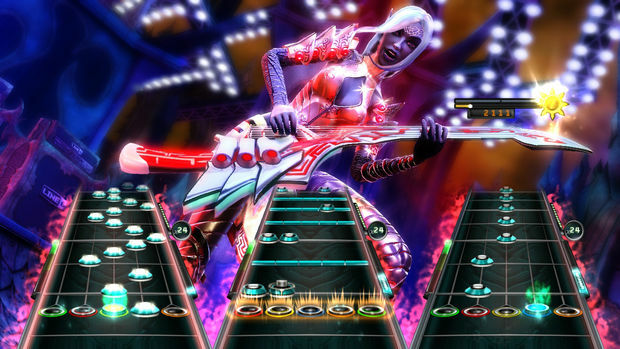 In addition to that, the game’s “Quickplay+” offers up a number of challenges for each and every song in the game, most of them spanning multiple instruments. If you’re a completionist, prepare to spend hours slaving over the game’s challenges, unlocking venues and items for your created rockers. 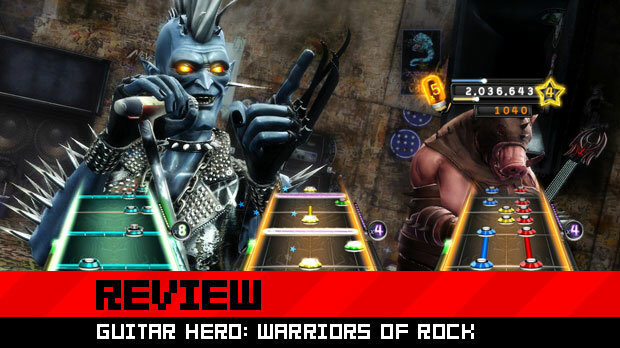 Warriors of Rock is a solid Guitar Hero offering for sure, and perhaps one of Neversoft’s best, despite the weird creative decision to include monsters in its primary experience. It’s a title that packs a ton of content and gameplay onto a single disc, and its import options for songs from previous titles will pad your song selections nicely. But it’s also an experience that feels remarkably similar to last year’s offering, and that’s unfortunate. Outside of the rockers turning into demons in the game’s oddball “Quest” mode, this is largely the same experience as Guitar Hero 5. For fans of the series, that’s not necessarily a bad thing, and they’ll find plenty to love here. But for those feeling burnt out on the music genre, unless a boar monster shredding on Steve Vai solo gets your heart pounding, Warriors of Rock likely won’t rekindle that dying flame.